We've been to Iceland several times, quite a few of them not long after or before a volcano erupted. When we were walking near Landmannalaugar on 8 July 1991 there was black ash on much of the snow, obviously fall out from the eruption of Hekla a few months earlier . Mostly it was just a very thin layer over the surface, but in one place the ash was sitting on the snow in small cones that were an inch or two high, see picture below. I've not been able to find any reference to this phenomenon, so this description is speculative. I think it unlikely that the ash fell in small heaps, but that initially it would be a more or less even layer. Since Hekla is only 25km away, and this was fairly coarse ash, it would almost certainly have fallen some time during the eruption, which lasted from 17 Jan to 11 March. Some later snow almost certainly fell on the ash, but eventually the snow must have melted to re-expose it. The ash layer would not be completely even of course, and the slightly denser areas of ash would lower the albedo as soon as the layer of snow above it became thin enough for the light to penetrate to the ash layer, and certainly once it was exposed on the surface. The darker patches would therefore warm from sunlight more than the surrounding snow. They would thus be more prone to melting, and the ash would sink down slightly into a hollow. This assumes that the 'old snow' forming the substrate is porous, so that the melt water can run through it, rather than having to run off over the surface. Over an extended period of freezing and thawing the majority of the ash might be washed down into the nearest hollow. Such conditions might occur with daily heating by the sun, while the air temperature was still mainly below freezing. This process of selective warming is the same as that which causes cryoconite holes in glaciers. It could explain the concentration of the ash, but it would be in pits (like a cryoconite hole) rather than standing on the surface. The only mechanism I can think of for lowering the surface round the ash piles is a much more rapid melting of snow driven mainly by an increase in air temperature, rather than by solar gain. 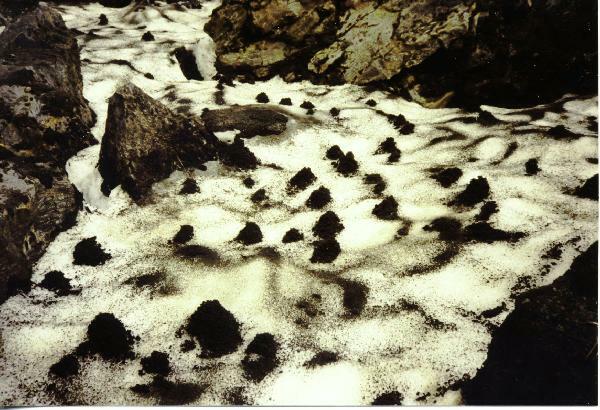 Under those conditions the albedo of the snow would have little effect and melting would occurr mainly at the surface of the snow between the ash pits. If the recent season's snow were more lightly packed then it would melt more easily than the underlying permanent snow, so most of it would disappear leaving the ash piles sitting on the older consolidated snow, looking like glacial moraines. That explanation sounds plausible, but it could be wrong. If you know (or think you know) a better explanation of how these piles of ash really formed, I would love to know, so please contact me .